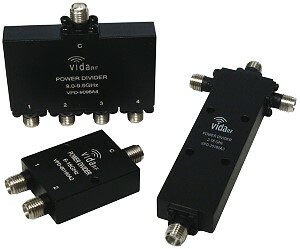 VidaRF offers a wide selection of 2-way through 64-way power divider/combiners, designed to cover 100 MHz to 20 GHz with average power handling of 30 watts for narrow, octave, dual and multi-octave band applications. Standard connector type: SMA female, other connectors available upon request. VidaRF is a North Carolina based company that is focused on being a solutions provider by building to customer specs and offering zero days lead time for custom parts through their stock and ship program.